Back to school is huge yearly event – whether it’s your child’s first school year, third, or tenth! As with any big milestone, celebrating it is fun! Traditions don’t have to be elaborate. These are ten very simple traditions you can start now. Many of them are ideas you can do before school starts, or in the early days of the year, to talk about what your child is thinking about the new year, what excites them, worries them, any questions they have (we also like to do this while playing our Back To School I Spy Game!). 1. You can take a picture in the same place every year, like the front steps. Even if you move – always take a picture sitting on steps, or by a door. Or by a tree, and watch the tree grow with your child! 2. Signs! Print out first day of school signs. Or have your child hold a chalkboard with the school year (you can even do this as a group shot with all your kids!). 3. Take a picture on the first day, and on the last day of school take a picture of your child holding a picture of that first day picture. 4. Have a party! : I love Toddler Approved’s School Will Be a Blast Rocket party! Even easier – you can never go wrong with putting a candle on a cupcake! Throw on a candle with a grade number (or a K or a P if you have littler ones)! You could also do this with a morning muffin for a back to school breakfast treat! 5. 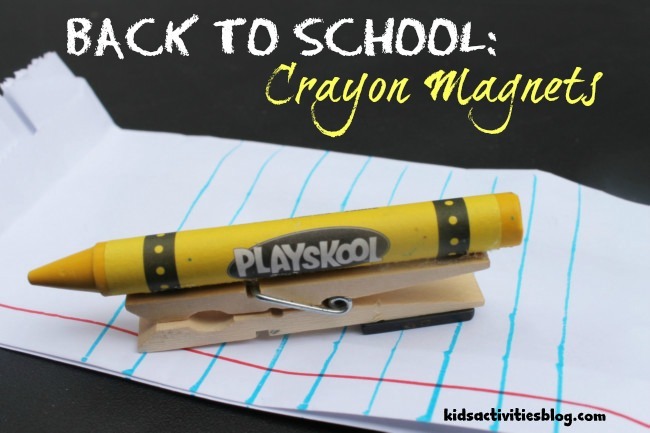 Decorate a pencil box to hold all those new back to school supplies. Use stickers, or Mod Podge favorite magazine clippings to the tin. 7. Decorate back to school magnets to hold all those masterpieces and aced tests! 8. Decorate a picture frame to hold that first of school picture! You can get basic unfinished wood , or even paper , frames at craft stores, which your kids can personalize however they choose: paint, glitter, stickers, stencils – the sky’s the limit. 9. Have a big “School Playground Games” playdate. Break out the schoolyard games: corners, hopscotch, jump rope, balls – all your favorites! 10. Interview your child – Use our free printable or ask questions like “What are you most looking forward to about being a Kindergartner? What game are you excited to play at school? Who do you want to sit next to at lunch?” I find that my (almost!) Kindergartner has patience for about 5-8 questions, depending on how silly they are! I plan to ask similar questions each year, so we can see how the response changes. Honorable mention (am I allowed to do that on a top 10 list? ): My husband’s idea? Come up with a new handshake to do each year with your kids!